Bob Walser will be visiting us on Monday 23rd October and will perform an extended spot. He has lots of admirers in this country, so it’s likely to be a busy night. 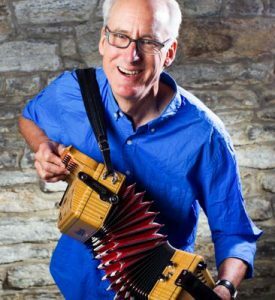 Bob is a folklorist, singer and multi-instrumentalist from Minnesota specialising in sea songs, and will be visiting the UK as part of his engagement on the James Madison Carpenter Project (see below). The James Madison Carpenter Collection is an extensive collection of traditional songs and folk (mummers’) plays recorded between 1927 and c.1943. The collection was made by Dr James Madison Carpenter (1888–1983) using a Dictaphone machine and portable typewriter. Most of the items date from 1928–1935, when Carpenter carried out fieldwork in Britain; the remainder were gathered in parts of the US. Although Carpenter edited some of the corpus, it was never published. He sold the collection, which comprises papers, wax cylinders, lacquer discs, photographs and drawings, to the Library of Congress in 1972. The collection has recently been digitised, and work is progressing to publish the transcriptions.